The Lancaster City Council met for its Regular Meeting on Wednesday, April 12, 2017, at 7:00 p.m. in the City Hall Meeting Room. The following members were present: Sebenaler, Bowlin and Nordin. Olson and Hilman was absent until 7:30PM. Sebenaler called the meeting to order as Acting Mayor. Others present Mike Whitlock and Gaye Allen. Bowlin moved to approve the Council minutes of the March 8, 2017 regular meeting, second by Bowlin and carried. A copy of the Minutes will be posted at the Lancaster City Hall and U.S. Post Office and available upon request to the clerk. The council reviewed the April 2017 bills presented this night; any other bills that have been paid prior to this meeting to avoid late payments, receive discounts & meet payroll and all payroll expenses as approved in the 2017 Rates Fees & Appointments Schedule. Bowlin moved to approve the bills, second by Nordin and carried. An abstract of bills will be posted with the minutes and are available upon request to the clerk. Council reviewed new Sunday off-sale liquor sales laws effective July 1st, 2017. The city liquor ordinance defers to state statute for laws governing liquor sales so there is no need to amend the city ordinance. Council reviewed floodplain ordinance information from FEMA and MN DNR. A floodplain ordinance must be passed by September 2017 in order for anyone within the floodplain to obtain flood insurance. Bowlin moved to proceed with the floodplain ordinance process, second by Nordin and carried. At this time Mayor, Mike Olson and Jim Hilman were in attendance of the meeting. Council discussed road maintenance needs on Manitoba and Washington Street. Nordin moved to have county blade do additional work and have gravel placed, second by Bowlin and carried. 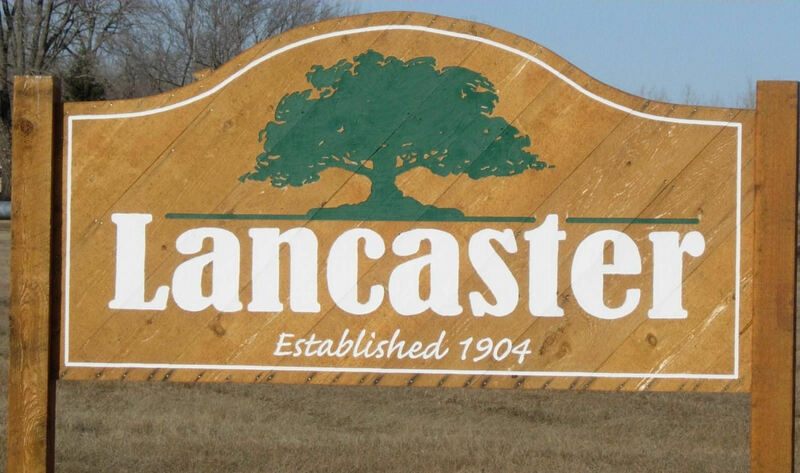 Mike Whitlock, representing the Lancaster Business Association, asked that the city add extra garbage cans and have them cleaned out during the Lancaster Heritage Days. Nordin moved to purchase 6 large garbage cans, second by Hilman and carried. Olson stated that he would arrange for additional help to take care of garbage removal. Whitlock also requested that the city contribute funds to the Lancaster Business Association for the Heritage Days event in June. The event is well attended and is an economic driver for the community. Hilman moved to appropriate $1,000.00 for economic development, second by Bowlin and carried. Gaye Allen met with the council to ask that the council consider selling the Centennial Hall (Old City Hall) to her for the ongoing use of the building in her business Vintage Plus. Allen offered to purchase the building for $6,000.00 as is with Allen to pay all attorney fees. Allen also stated that she would be willing to continue the rent contract on a short term basis. Council tabled the purchase offer. Sebenaler moved to have a special meeting May 2, 2017 7:00PM at the City Hall to discuss options for the Centennial Hall, second by Bowlin and carried. Clerk and council will obtain Income and Expense for the Centennial Hall; remodel and demolition expenses. Clerk reported that the Central Avenue street recording has been completed. Council discussed the insurance and other costs of holding the proposed rodeo event. Hilman moved to not continue with the rodeo plans due to the overall cost of the event, second by Bowlin and carried. Debbie Groves, cleaning person at Community Center reported that she is able to paint the lower walls but would like to hire Denise Strege as contract labor for $25.00/hour to paint the upper section of the walls. Sebenaler moved to approve the complete wall painting and installation of chair rail in the community center and to have Groves coordinate same, second by Nordin and carried. Progas quotes $1640.00 to install water softner and 2 hard water lines in the communty center. Nordin moved to approve the installation, second by Sebenaler and carried. Council discussed the need to limit truck traffic on Manitoba Street due to damage done to the road. Bowlin moved to purchase 2 signs, second by Hilman and carried. Fire Department requests the purchase of a 20 foot tilt bed aluminum trailer from The Trailer Connection for $3,105.00. Sebenaler moved to purchase the trailer, second by Nordin and carried. Bowlin moved to advertise the Fire Department 14’ Aluminum Trailer for sale on bids, bid opening to be at the June 9th, 2017 council meeting at 7:30PM, second by Sebenaler and carried. Fire Department requests to purchase 2 additional SCBA airpacks, masks and voice amps that match for $7350, because these are Demos the cost is ½ price of the full price. Nordin moved to purchase the 2 SCBA’s, second by Sebenaler and carried.